My "S" word for today is "Seafood". I love all seafood : prawns, scallops, calamari, any fish, abalone, clams, mussels, whitebait, crayfish but my very favourite would have to be "Oysters". I have been known to have my meal and then finish off with oysters, so I can keep the yummy taste in my mouth. Of course they have to be natural - no toppings for this girl. Ask my good friend Alice and she will quickly tell you that you can almost guarantee that when we go out anywhere for dinner I will have some sort of seafood. Well last night we did go out for dinner and I thought I wouldn't be a creature of habit (not that I am) and have something different for my meal - guess what it was not very nice and I was disappointed. Today is Shane's birthday so we decided to go out for dinner and guess what I had - yes seafood. I had a yummy big bowl of "Spaghetti Marinara" and I loved it. 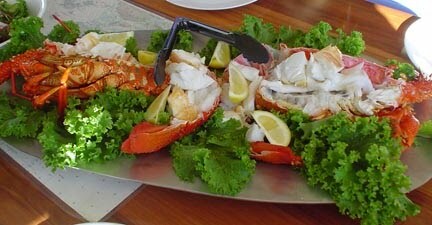 This is a crayfish meal I had on a yatch while visiting Flinders Island. A lady after my own heart, I also love seafood and what a fantastic meal you captured, yummmmy! Some of the ones on your list of seafood I've never tried, some I don't want to try, while others are so darn good! Have a fantastic day and Happy Birthday Shane! I love seafood but don't get it very often ....husband can't eat it! !